Cocker Spaniel ears are beautiful, but they are prone to health problems. Learn how to check your pet's ears for early signs of infection and how to keep them clean, healthy and problem free. Just look at those ears, aren't they beautiful? I never tire of brushing and stroking them. They're luxuriously long and pendulous, and so soft and silky to the touch. Unfortunately such beauty comes at a price! 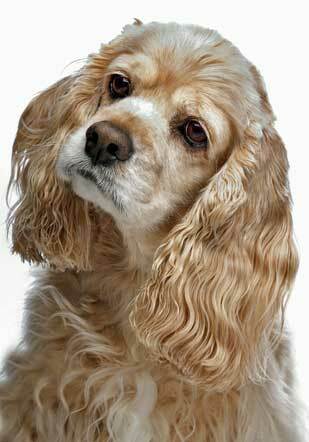 Cocker Spaniel ears need a little extra care and attention to keep them healthy and free from infection. 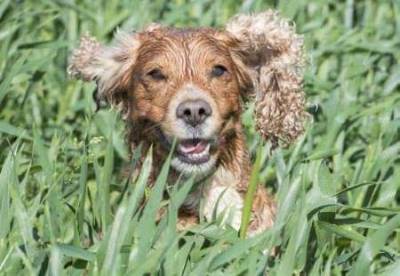 Our Cocker's ears may be prone to infection, but if you check them after each walk, make sure they're clean and brush them regularly, you'll be going a long way to eliminating the chances of bacteria, infection and other ear problems developing. Checking your dogs ears for early signs of infection(s) only takes a minute, so you should be able to do this every day. Lift your pet's ear and take a look at the condition of the skin. Does it look a nice healthy pink, or is it red and inflamed? It shouldn't smell, and there shouldn't be any discharge; a nice clean 'doggie' smell is what we want. A small amount of wax is fairly normal so it's not usually something you need to worry about; it can easily be removed when you're cleaning your dog's ears. If the inside of his ear is red or looks inflamed, or if there's a large amount of wax, particularly if it smells bad (like cheesy feet) or is very dark in colour, then your dog may have an ear infection. It's probably time to visit the vet. It's important to check your Cocker's ears for grass seeds or twigs after his walk, especially if he's lucky enough to have open fields to run through. Although it's good for him to run free like that from time to time (my dog loves it!) there's always a down side. Most of the year there's always something bursting into bloom or seed, whether it's grass seeds, burs, or other 'sticky' vegetation and they just love Cocker Spaniel ears! If you don't remove plant debris from your Cocker's coat, a stray seed could easily work its way inside your pets ear, or skin, causing considerable pain and eventual infection. You can easily tell if your dog has something in his ear. You'll see him shaking his head from side to side, (more than usual) or he may stand still and tilt his head to one side, as though he's listening to something. Frantic scratching is another tell-tale sign of dog ear problems. He may also yelp or show other signs of pain if you try to rub or touch his ears. If you suspect your Cocker has something stuck in his ear, unless you can see it without 'digging' into his ear, it's best you leave it and ask your vet to remove it for you. By design, Cocker Spaniel ears hang low and cover the opening to the ear which means that their inner ears don't get enough air circulating to keep them as healthy as they could be. There's usually quite a lot of hair on the underside of their ears, especially around the ear opening and this can also contribute to poor air circulation. This lack of ventilation can create a dark, warm, moist habitat - ideal breeding conditions for bacteria...and that's when the trouble begins! Let's see what we can do to make Cocker Spaniel ears less of a breeding ground for bacteria. You can help to improve the air circulation in and around Cocker Spaniel ears by removing any excess hair from just inside the ear opening. To remove this hair simply grip a few strands between your thumb and index finger and pull gently. If you prefer, you could use tweezers or a hemostat. Be sure to remove only a few hairs at a time and always pull in the same direction that the hair is growing. Be careful not to work any further into your dog's ear than about half an inch (12.5 mm) as this area can be quite sensitive and easily damaged. To get a better grip on the hair, you can spray your pet's ear with a little medicated powder (or baby powder) to help absorb any moisture and wax and to stop the hair slipping through your fingers. If you don't feel too confident about removing hair from inside your pet's ears, don't worry, your dog groomer will be able to do it for you or at the very least, show you how to do it yourself. The hair underneath the opening to your dogs ear canal can grow quite thick and can often clump into mats, unless it's brushed every day. I usually trim this area into a neat semi-circle or cut it back fairly close to the skin. Both methods will help to improve air circulation and will be much easier to brush too! 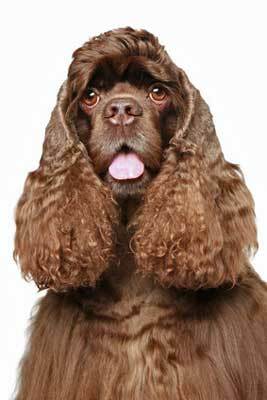 Some breeders and groomers also recommend shaving the underside of Cocker Spaniel ears (the leathers) to help keep them fresh. Whilst this works, I don't think it's always necessary. It's what I do for Max, but as with most things, it's a personal choice. Beautifully kept Cocker Spaniel ears! Keeping your Cocker's ears neatly trimmed and brushed will help to get the air circulating around the ear canal and will help to keep his ears cool and dry - lessening the chances of bacteria over-breeding. If your Cocker is a regular sufferer of ear infection or his condition is chronic, there are a couple of things you can do to help. Lift your Cocker's ears above his head (to expose his ear canals) and tie them gently together with a scrunchy to let the air get at them for a couple of hours each day. I can't guarantee how long they'll stay up though! If your dog tries to remove them, which he probably will, you can also use a stretchy tubular bandage (not the sticky sort mind you) with holes cut into each side. Just be careful that it doesn't slip over his eyes. Simply slip it over your Cocker's muzzle, over the top of his head and a little way down the back of his neck. Make sure the holes are lined up with his open ears so that it exposes them to the air. It might look a little odd, but it will do the trick! PS: In chronic cases I'm assuming your dog has been to see the vet and that he's given you medication or treatment for any infection. Letting the air to your dog's ears certainly won't cure infection, but it will help to keep the ears dry and prevent bacteria from growing in the first place. Whilst I recommend you watch for early signs of ear infection, it's important to get an accurate diagnosis and the correct treatment from your vet as soon as you can. It's not always easy identifying ear infections in dogs so the vet may have to try several treatments before he's successful which can be very expensive. Infections can be very painful for your pet and if left untreated there may be a risk of permanent damage. Doesn't it make much more sense, therefore, to be proactive by avoiding ear infection and other dog ear problems in the first place?